Special 6 week storytelling & game design workshop is coming to Doylestown. A limited number of students will have the unique opportunity to learn from industry experts as they step into a project based learning experience. Over the course of 6 weeks students grades 9th through 12th will learn how to design, build and run an escape the room game. Escape the Room games have taken NYC and LA by storm. To read more about Escape the Rooms click here. Lance Weiler award winning experience designer, Sundance Screenwriting Alum and founding member and director of the Columbia University School of the Arts’ Digital Storytelling Lab. 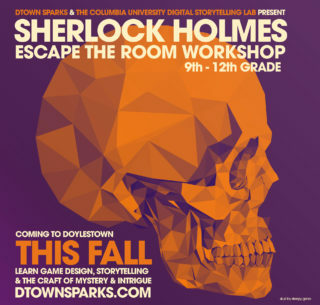 Proceeds from the course and the Escape the Room game will go to the design, build and support of dtown sparks a learning lab for k-12 that will open in Doylestown in 2017.